Two women have accused Lt. Gov. Justin Fairfax of assault, and he has emphatically denied both allegations. After the second allegation was made Friday, Fairfax — who stands to become the state’s second black governor if Gov. Ralph Northam resigns over a racist photo — was barraged with demands to step down from top Democrats, including a number of presidential hopefuls and most of Virginia’s congressional delegation. Moments after Northam’s Friday meeting with his Cabinet, a second woman went public with accusations against Fairfax. A lawyer for Meredith Watson, 39, said in a statement that Fairfax [assaulted] Watson 19 years ago while they were students at Duke University. The lawyer, Nancy Erika Smith, said her team had statements from ex-classmates who said Watson “immediately” told friends Fairfax [assaulted] her. A public relations firm representing Watson provided The Associated Press with a 2016 email exchange with a female friend and 2017 text exchanges in which Watson said Fairfax had [assualted] her. Fairfax denied the new allegation, as he did the first, leveled earlier by Vanessa Tyson, a California college professor. Top Democrats running for president in 2020 called for Fairfax’s resignation, including Sens. Cory Booker of New Jersey, Kirsten Gillibrand of New York, and Elizabeth Warren of Massachusetts. 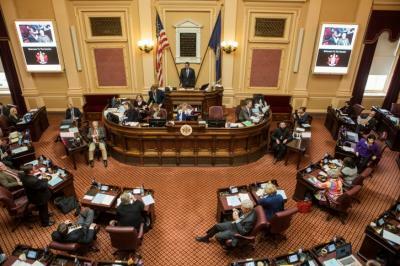 Virginia’s Democratic congressional delegation was split. On Saturday, Virginia’s House of Delegates Speaker Kirk Cox joined the chorus calling for Fairfax’s resignation. Cox — a Republican, and third in line for governor should Northam step down — said in a statement that Fairfax’s ability to govern has been “permanently impaired” by the “multiple, serious credible allegations” of assault.